To stabilise the global climate, it is vital to tackle the growing increase of GHG emissions from developing countries. In particular, proactive actions should be taken in emerging Asia. 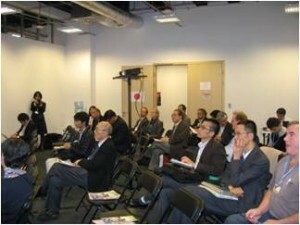 This side-event is based on the discussions at the LoCARNet 2nd Annual Meeting in July 2013 in Yokohama, Japan, and aims to introduce some challenges dealt with in Asia, including presenting analysis on GHG reduction potentials using the AIM model by researchers in Asia; evaluating the reductions target in each country; and suggesting necessary policies to implement efficient reductions in each country. The side-event would like to facilitate further discussions how Asia can reduce GHG emissions towards attaining the two degree stabilisation target. At the beginning of the side-event, Mr. Kotaro Kawamata, Ministry of the Environment, Japan, stated that the Asian region continues to develop as a result of economic growth. He expressed his strong expectation that Asia can become a world leader as the region moves forward to create low-carbon societies, with its gaze fixed firmly on the future. Dr. Shuzo Nishioka of the LoCARNet Secretariat stated that global CO2 emissions are expected to increase substantially, and if current trends continue, greenhouse gas emissions from developing countries, especially in the Asian region, are expected to comprise half of all global emissions in 2050. Therefore, he pointed out that Asia has to take necessary countermeasures as early as possible, if our goal continues to be achieving the two degree target. On that basis, Dr. Nishioka introduced the activities of the Low Carbon Asia Research Network (LoCARNet) being conducted in selected countries in Asia. These activities include supporting researchers and research communities in-country develop their research capacities; formulating low-carbon plans and strategies with those in-country researchers for their countries; and facilitating information exchange and knowledge-sharing on the occasion of LoCARNet annual meetings and at other opportunities. Dr. Mikiko Kainuma of NIES stressed that Asia has to move into action as soon as possible, and a leapfrogging-type development in Asia will lead to achievement of a low-carbon society. She stated that Asia possesses the innate ability to turn challenges into opportunities, and expressed the strong message that the two degree target will be eminently feasible. Dr. Jiang Kejun of ERI expressed his views that to achieve the two degree target, China will have to deal with some key issues, such as conducting economic structure optimisation policies, improving energy efficiency, introducing renewable energy and nuclear power generation, promoting CCS (carbon dioxide capture and strage), and encouraging low-carbon consumption and lifestyle change. He also mentioned that for China to become a low-carbon society, technological progress will be indispensable. Prof. P. R. Shukla of IIMA stated that participation in two degree stabilisation will create substantial changes and challenges on both the demand and supply sides. Any altered choices would create additional costs in the short-run, but introducing policies that align CO2 mitigation and sustainable development can deliver significant co-benefits to off-set any additional costs. Prof. Ho Chin Siong of UTM indicated that in order to achieve the 40% reduction target for emissions, more intensive implementation is needed especially in the energy sector. In addition, he mentioned that apart from mitigation measures, Malaysia should also focus on adaptation efforts which build resilience against potential impacts. Finally, the side-event reaffirmed the growing importance of the role that Asia will play towards achieving a global two degree target. The side-event also stressed the significance of LoCARNet activities in this context, and reiterated the expectation that LoCARNet will continue these activities.